Land-based casinos have never hidden the fact that they use architecture and design to lure players in and create an atmosphere which is comfortable for gambling. In short, architects and interior designers have come up with the solutions to optimising casino floors and making the players enjoy their stay at a casino. They took into consideration various elements, such as colours, lights, even the order of casino games. Two dominant designs turned out to be the most beneficial for casinos at the moment. However, they seem quite contrary to one another. Bill Friedman was a former gambler addict who was in love with numbers. Not only that; he was the first person to study how gamblers behave in casinos and proposed several principles to which architects and designs must adhere in order to make casinos attractive. The only two things relevant were the number of visitors gambling at the moment, and the number of people coming back to gamble. He composed a huge book called Designing Casinos to Dominate the Competition. In it, Friedman evaluated what makes a casino successful and came up with a solution of his own. He covered all aspects of a casino’s design and set out 13 principles. For example, principle 8 claims that low ceilings are always better than high ceilings, whereas principle 4 indicates that the maze design of passageways is better than the one wherein they are long and straight, and so on. We should mention that some rules apply even to online casinos. For example, if you check out one of UK’s casino sites, Mega Casino, you should be able to notice some similarities. His principles worked up to a certain extent but were a far cry from being perfect. In fact, Friedman’s design gave birth to a lot of popular myths regarding casinos. You probably heard people speculating that casinos have no clocks and windows to mislead players and make them lose track of time. However, at one point, Friedman became outdated. He used sheer deduction to come up with his design but forgot about the aesthetics along the way. Luckily, Roger Thomas showed up and came up with a brand new design in collaboration with Steve Wynn. He stated that people would feel trapped and anxious in maze-like casinos with no natural light. Furthermore, Thomas criticised the overall approach and the lack of luxury in Friedman’s design. Therefore, he came up with a design of his own, and luxurious is the perfect word to describe it. He claimed that people want to feel rich and luxurious in casinos, as they would like to take on characteristics of a room. In other words, show them luxury and wealth and they would immediately be in the mood for gambling. Thomas raised the ceilings, added interesting ornaments, decorated the lobby with elegance, and made the overall gaming floor design more straightforward. Furthermore, he re-introduced windows and made them big and shiny as well! He named his arrangement of machines ‘a playground casino floor’ and it was a complete opposite to the concept Friedman had had in mind. According to this article, slots have remained the primary source of entertainment for the majority of people who visit casinos, regardless of the gaming floor design. The scents in casinos were a subject of several research papers. The scientists came to a conclusion that slots which exuded a pleasant scent attracted more gamblers than those that were odourless. Sites for online slot machines, like Prime Slots, will definitely not be able to add any scents to their slots. Therefore, you could always go with an online variant if you are afraid of being enchanted by fragrances from land-based slots. Colours have been a subject of discussion among many casino floor designers as well. Many believed that a combination of several sharp colours should attract gamblers. That changed recently as well, as many designers nowadays opt for a single shade that is used strategically, thus satisfying both the psychological and the aesthetic aspect of the design. Music also plays an essential role in casinos. While it was crucial for Thomas’ playground casino, Friedman overlooked its importance. A team of researchers conducted the research which gave positive overall results when music was introduced to a casino. In fact, this one should go without saying, as music is widely accepted as the basis for a good marketing strategy. 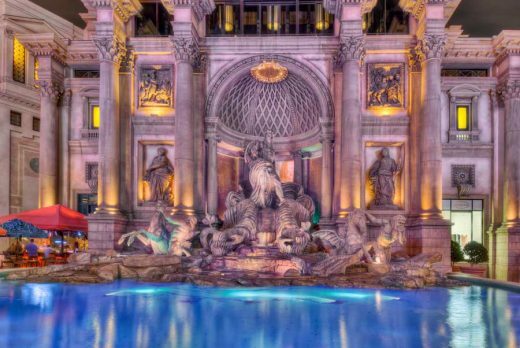 The architecture and design of casinos are always meaningful, but we have to agree that there is more than one appropriate formula for casino decoration that would be the most beneficial. Apart from Friedman and Thomas, other architects and designers have introduced various changes and even combined the two designs, thus making the best of both worlds. Nowadays, Thomas’ suggestions are gaining more recognition due to his ‘luxurious’ approach. Since the introduction of online casinos which anyone can access in just a couple of clicks, land-based ones are highly regarded as prestigious nowadays, and the visitors want to taste a part of that luxury either by winning cash prizes or by merely being in one such casino. Next time you are in a casino, feel free to examine its architecture and design of the gaming floor – you might be able to make some conclusions on your own!